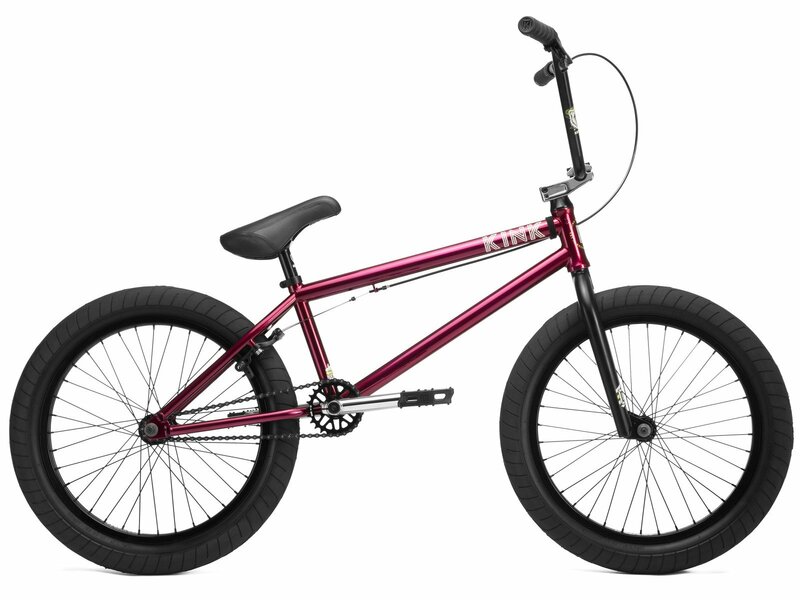 The Kink Bikes "Whip" 2019 BMX Bike - Gloss Raspberry Red is a mid-class BMX complete bike for advanced riders with a 20.5" inch top tube and shorter rear end which offers a high quality basic equipment with a frame, a fork and a handlebar made of 100% 4130 CrMo. The frame includes an integrated headset and Mid BB which is today's standard on high quality BMX frames and which makes installation, adjustment and maintance easy. This Kink Bikes "Whip" 2019 BMX Bike - Gloss Raspberry Red is equipped with a full sealed cassette hub and front hub, a rear U-brake, and a stable 3-piece CrMo crankset. But also a topload stem, a high handle bar and a set of 2.4" tires and a great looking color contribute to a modern overall appearance. Pedals: Kink "Hemlock", plastic, 9/16"